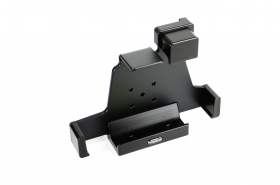 Vehicle mounting dock with locking mechanism. Requires an additional mounting arm solution for mounting. It is compatible with ProClip, Ram Mount and other 4-hole AMPS Pattern accessories. Includes two locking keys.